In preparation for an offensive on Mosul, a major stronghold of Daesh (also known as ISIS/Islamic state) in Iraq, a new weapon, in the form of a robot armed with a machine gun, will reportedly be deployed. A wheeled ground vehicle, dubbed “Alrobot” (‘robot’ in Arabic), is being prepared for combat in northern Iraq, the Baghdad Post reported. 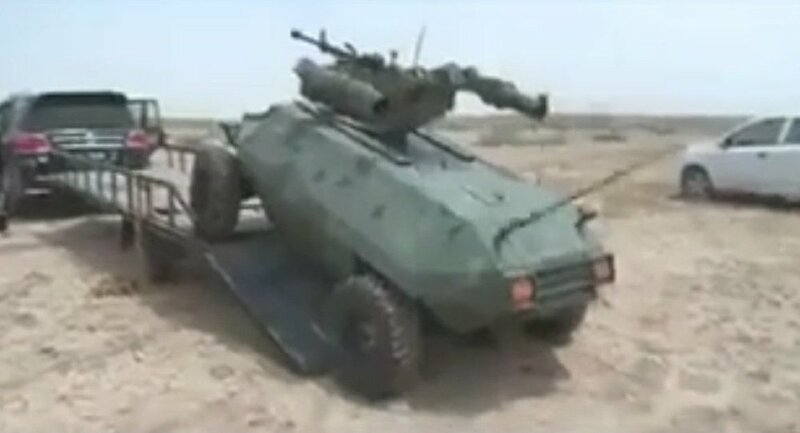 Video footage displaying the Alrobot showcases that the machine is the size of a mini-car and has an automatic turret appearing to be based on the Russian Degtyaryova-Shpagina Krupnokaliberny (DShK) heavy machine gun and a launcher compatible with Russian Katyusha missiles. Alrobot is not a fully autonomous machine, and is operated via laptop and radio link at a distance of up to one kilometer, the report noted. The robot is fitted with four cameras which act as the eyes of the operator on the battlefield. “The armored robot seems to be part of the Iraqi military arsenal in the offensive to liberate Mosul from ISIS,” Elliot Zweig, deputy director the Middle East Media Research Institute, speaking to Defense One, commenting on the Alrobot. Two Iraqi inventors are reportedly behind the development of the machine. Their names have not been made public. Iraqi officials have remained silent on reports about Alrobot. It is also unknown when will it be deployed in battle. If deployed, Alrobot will likely become the first battle robot to fire at enemies in Iraq. Previous attempts to engage armed remotely operated vehicles in warfare there have been made by the United States and have been deemed failures. In 2007, the Pentagon sent three Special Weapons Observation Reconnaissance Detection System (SWORDS), robots armed with M249 machine guns, to Iraq. Technical problems prompted Americans to leave the robots behind, and they were never used in combat. Mosul, located 400 kilometers north of Baghdad, is one of the major Iraqi cities seized by Daesh in 2014. The city is now being attacked by Iraqi government forces from the south and Kurdish Peshmerga forces from the north.